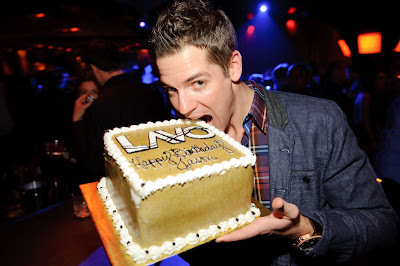 Birthday celebrations took center stage at LAVO on Saturday night. Breaking Bad’s Krysten Ritter, who turned 28 on Wednesday, was joined by friends for the party, including actor Ivan Sergei, her co-star in the upcoming Starz series “Gravity.” After a dinner that included Kobe Meatballs, Sea Bass and Chicken Marsala, the grouped headed up to a VIP table in the nightclub where Krysten danced closely with Ivan on the banquette to the sounds of DJ Crooked. The actress beamed when the DJ gave her a shout out and led the entire club in singing happy birthday as a cake was brought out – Krysten couldn’t resist and tasted the frosting on the spot. 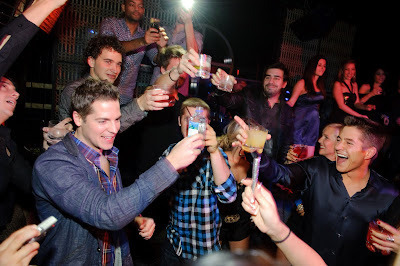 The birthday girl was spotted dancing and drinking champagne to kick off her Vegas weekend at TAO on Friday night. Also blowing out the candles for his 28th birthday was E! Entertainment correspondent Jason Kennedy. Accompanied by a bunch of friends, the group sat down to dinner of Grilled Tuna with Roasted Artichokes, Filet and Chicken Parmagiano and Saggio and Sicilian Sun specialty cocktails. Once upstairs the entertainment TV personality took over a VIP table in front of the DJ booth and celebrated with a cake. Like Ritter, Kennedy found it so tempting he bit into the side right away. Sugar Ray rocker Mark McGrath and producer/director McG were spotted dining at TAO Saturday. A dinner of Sea Bass, Kobe Beef and Sushi was accompanied by Ketel 1 cocktails. Taking over the private dining room at TAO was Wayne Gretzky, throwing a 21st birthday weekend celebration for his daughter Paulina. After a feast of signature Asian dishes they made their way to a VIP table on the dance floor to take in the sounds of DJ Vice.